Easyhost Review 2019: Is Easyhost a Good Hosting? Easyhost may be an easy way to acquire basic web hosting, but they fall short in several areas. Primarily, their services offer only basic features. Beginners and those looking for robust shared hosting should look elsewhere. Easyhost is a U.K.-based provider that offers shared website hosting services along with reseller hosting, news hosting, and reseller hosting. Their shared hosting services are basic and lack some advanced features you’d see from other hosts. Also, their customer support is poor making this site not recommended for beginners. While free SSL certificates are nice, I would like to see more security features such as Anti-DDoS and Cloudflare protection. SpeedBoost will help your website operate faster while you can use Who’s Visiting to track traffic to your site. Easyhost doesn’t offer a website builder for their site, and the only auto-installer I could confirm with the company is WordPress. They do offer cPanel access, but reports indicate that the cPanel may be a bit dated. As such, this host isn’t suited for beginners. EasyHost offers two forms of shared hosting services. The first is their Garage plans that provide WebGarage tools to optimize your website. The only primary difference in the plans is the number of domains you can host. Garage Essential allows you to host a single domain while Garage Focus provides for three domains. With Garage Prime, you get unlimited domain hosting. The only other difference is a pair of add-on features offered on Focus and Prime accounts. They both offer SpeedBoost and Who’s Visiting tools free for one year. Note that if you don’t already own your domain, you will have to purchase one with these plans. Their domain pricing is a bit expensive, so you’ll save money by buying a domain name elsewhere and transferring it to EasyHost. 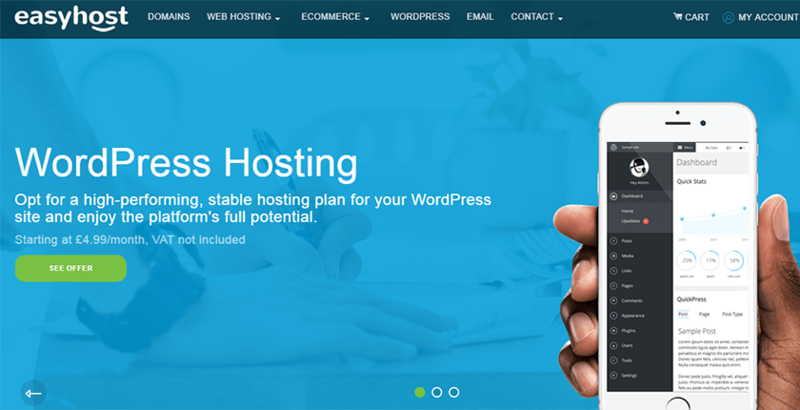 If you’re looking to use WordPress or looking to build an E-commerce site using Woocommerce, Prestashop, Opencart, or Magento, EasyHost offers individualized hosting options for those platforms. Note that these platforms all are more expensive than standard hosting, sometimes significantly more expensive. One thing that is not easy with EasyHost is their customer support. The only available support is email support, and while it is listed as 24/7, there’s no ETA on a response. I contacted them via email, and it took them 48 hours to respond to a simple question, and they didn’t answer my question fully. Also, their Tech Support page times out with an error. If they can’t bother to keep their tech support page online, how helpful are they going in helping you with your website? Current and former customers agree that their support is atrocious. A company with the name of EasyHosteasy should at least be a good basic web host. The reality is that they are not suitable for beginners and advanced users due to the lack of features, setup tools, and poor customer support. Take the advice that others have given about this company and avoid them. Wondering how Easyhost stacks up against other Web Hosting companies? Enter any other Web Hosting company and we will give you a side-by-side comparison.